Stellar Four: Who's Reading Casual Vacancy? So, The Casual Vacancy, the all-growed-up adult book by famed children's author JK Rowling is out. I'm not reading it today. I rarely buy hardcover books, yet the Harry Potter series was one I pre-ordered and devoured the second the newest release came out. I should be all over the latest from Ms. Rowling, right? Right? It's not just the price, although at $20+ for the hardcover and **cough**gasp**sputter $17.99 FOR THE EBOOK, this one is a bit out of my book budget. It's not even that I think it will be bad, per se. It's just that, like the poor actor that gets an iconic role and finds they are forever associated with it, I find it hard to think about a Rowling book that doesn't have anything to do with Harry Potter. And here's the thing, usually I have no issue whatsoever if an author changes it up and writes outside their genre. I actually enjoy it most of the time. Here I am though. A little bit blocked. A little bit meh about the whole concept. Probably because even though I know it's not a book about wizards, I will be a little disappointed to find no magic inside. I know I will eventually read it, and right now I'm #104 on the list at the library. Maybe by the time I actually get my hands on it I'll be more in the mood to enjoy it. Time will tell. How about you? 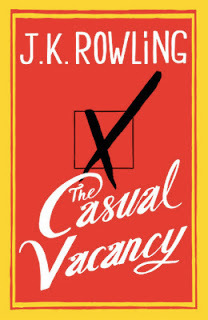 Are you reading The Casual Vacancy today? I'm eager to read it because I think it can be exciting when a writer, or any creative, steps outside their comfort zone. But at that price I'm going to have to get it at the library. I got it today from my library. I was not willing to dish out the cash for an unknown. I hope it is good but I am doubtful from past experience with other authors. I'm not going to read it. I'm curious, but it's expensive, and there aren't any English libraries around my place. I can only justify spending that amount of money on textbooks or fantasy novels!